Vietnam didn’t reinforce perceptions of U.S. toughness to allies. In fact, it may have done the opposite. Why do we continue to revisit the Vietnam War, or any historical event? Because we hope that the disastrous experience will hold lessons for future strategic decisions. The best that might be argued about the Vietnam War is that it established, for U.S. allies, that the United States would expend tremendous amounts of blood and treasure for areas that Washington didn’t really care about. This, consequently, would indicate U.S. toughness, and preempt aggression in areas the U.S. did care about. Many arguments in modern geopolitics run along the same lines. By fighting in Syria, or Iraq, or Nigeria, the United States can show toughness and deter potential aggressors in other areas. Putin, we like to say, is always watching, and presumably is assessing the toughness and resolve of American leaders. But did the loss of 56,000 American lives and a tremendous amount of U.S. treasure really convince anyone that America was tough in the 1960s and 1970s? A new article in International History Review suggests not. Effie Pedaliu studies the failure of the United States to fire up more enthusiasm about the Vietnam War in Europe. Despite U.S. efforts, none of the NATO allies bought into the logic that fighting the Communists in Vietnam would make it unnecessary to fight the Communists in Central Europe. Instead of making U.S. allies more confident in America’s willingness to defend them, the Vietnam conflict made NATO countries skeptical of whether the United States could focus on their defense. They were right to be worried; there is little question that fighting in Vietnam reduced the short-term capability of the United States to fight a war. The Army, Air Force, Navy, and Marines all suffered from major organizational problems while trying to translate their “big war” doctrine into a “small war” framework. 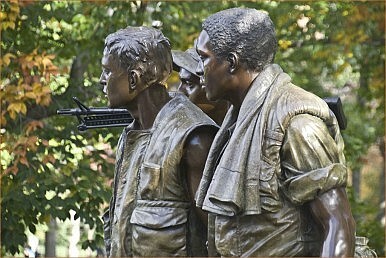 The Vietnam experience further served to undermine organizational morale, and reduce civilian confidence in the military. In the long run, the experience of Vietnam probably helped improve the U.S. military, as it was able to identify and resolve many serious shortcomings, but NATO and the United States were quite fortunate that the Soviets had no interest in initiating a conventional war in the early 1970s. This is something for the United States to keep in mind as it considers the wisdom of diverging from the U.S. rebalance to the Asia-Pacific. Efforts to establish credibility by fighting ISIS in Iraq, Boko Haram in Nigeria, or Russia in Ukraine could conceivably restore U.S. “credibility,” although mostly by accident. Every new commitment, however, has the potential to indicate to prospective U.S. allies (and adversaries) in East Asia that the U.S. is not particularly serious about contributing to the containment of China. Indeed, the situation is now reversed, and we’re asking ourselves whether failing to stop Russian aggression in Ukraine will fatally undermine the confidence of the Hanoi government in American toughness and resolve.